Stock aerial photography, aerial photographer. The entire content in this site is copyrighted. Downloading, displaying, reproduction, distribution, of any image is not permitted. I started to fly in 1988 after I got my private pilot license in Las Vegas, Nevada, USA. Back then, I did not have a camera on theses flights, but rather, I was taking international tourists with cameras on aerial sightseeing to show them the stunning scenery of the American West from 500 feet above ground level. Aerial photography came later in the early 2000's. To build my library of aerial photos, I have flown Airplanes, Drones, Paragliders, and Paramotors. 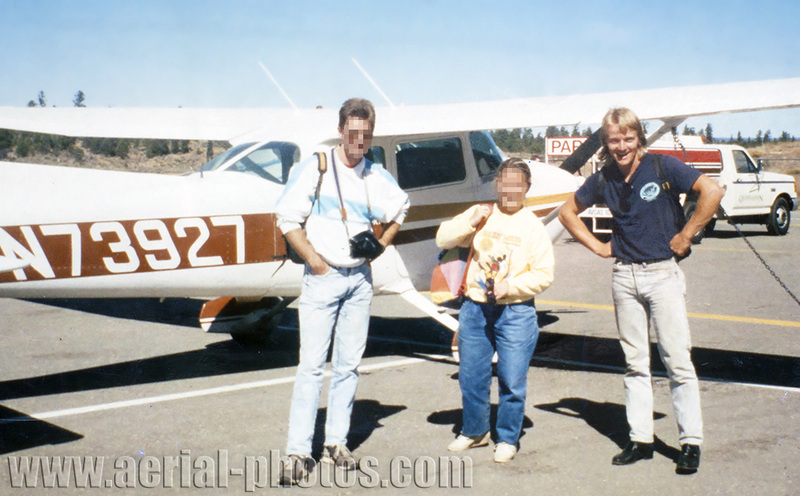 The photographer (right) and his passengers after a sightseeing flight in a Cessna 172 over the Grand Canyon in Arizona, USA (in 1989). 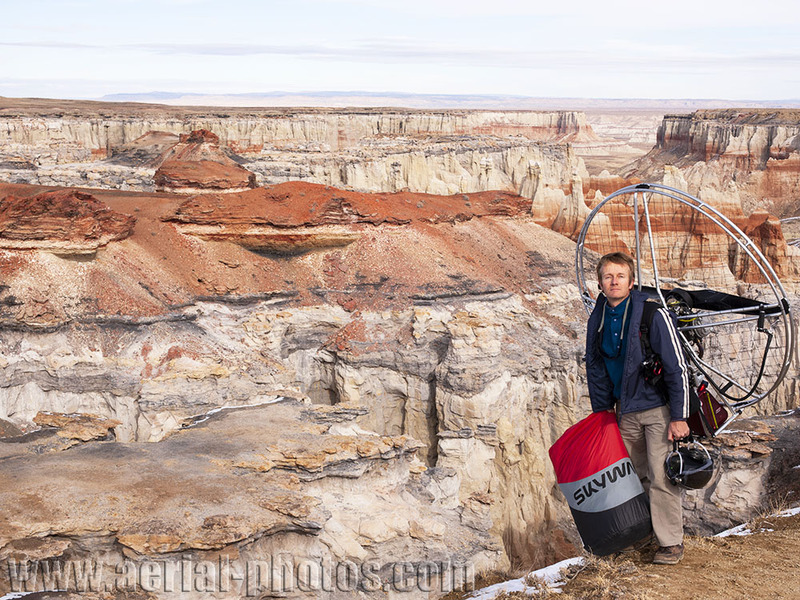 The photographer with his amazing portable aircraft on the rim of Coal Mine Canyon. Navajo & Hopi Reservations boundary, Arizona, USA (in 2007). For aerial photography, I will fly different aircrafts depending on weather, budget, airspace restrictions, etc. AIRPLANES I fly Cessnas (152, 172, 177). I like in particular the 177 RG as this high-wing aircraft has a Retracting Gear and no wing struts to obstruct the field of view. 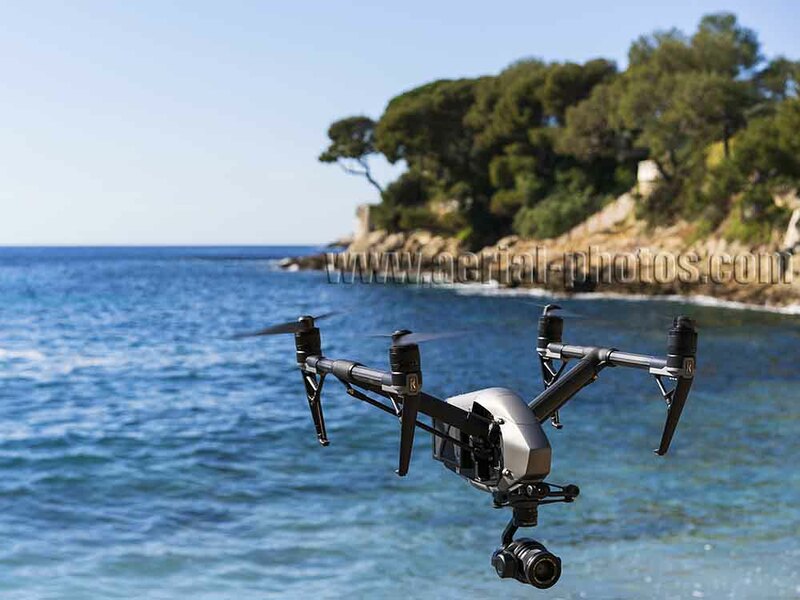 DRONES the DJI Inspire 2 is a fantastic tool for aerial videography, but the quality of a still picture with its X5S camera is not nearly as good as what we can get from a camera with a full frame sensor. A bigger drone capable of lifting a professional full frame camera would not be as cost effective as a paramotor as such a drone costs much more to buy. A while ago, I lost the Inspire 2 as it was not responding for some unknown reasons, and consequently crashed. 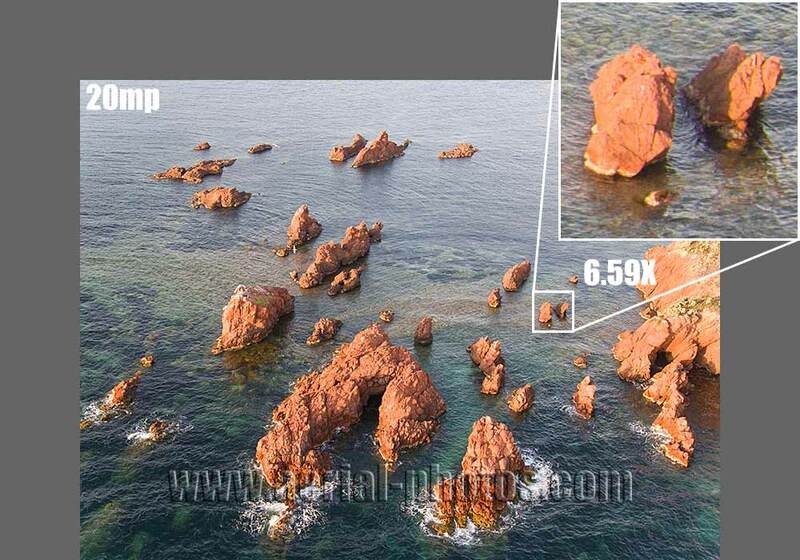 The log record was inconclusive, so DJI decided not to replace it although it was under warranty. With that $6500 setback, I am not, for the time being, using a drone. HELICOPTERS I do not fly helicopters but on some occasions, I will charter one such as a Robinson R22 for some shootings when airplanes, paramotors or drones are inadequates. PARAMOTORS They are fantastic aircrafts for aerial photography. They are easier and safer to combine the activities of flying and taking photos at the same time. Their slow speed (20 to 25 knots / 37 to 46 kph) makes them easier to compose the approaching subject. As an environmentalist, I'd rather use a flying apparatus that is "greener". 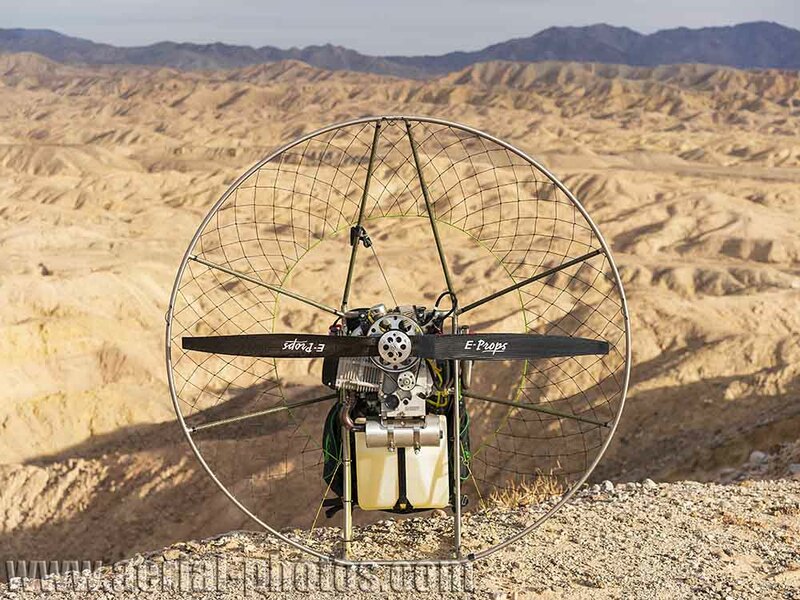 This paramotor's 4-stroke engine (manufactured by BaileyAviation) is quiet and has an astonishing gas consumption of only 2 liters per hour (as compared to 40 liters per hour with a Cessna 177 RG). It sips gasoline, yet, it has enough power to reach altitudes of 5km or more. Its 10-liter gas tank allows for a 5-hour flight (as compared to the 15 to 20 minutes maximum with a drone). Since it is a motorized paraglider, I can when I encounter some updraft (column of rising warmer air) shut off the engine, soar quietly with the eagle and gobble up the amazing sights. Aerial photography without an aircraft is possible with the use of a TELESCOPIC MAST dedicated to photography. This is my favorite tool for low aerial photography. It can extend up to 10 meters and offers a wide range of very interesting photographic possibilities while being very cost-effective. It is a great tool (and only option) when shooting above a crowded space in an urban environment. The light Sony α7R III is wirelessly connected to a smart phone attached at the base of the mast and basic camera setups and shooting can be done from it. 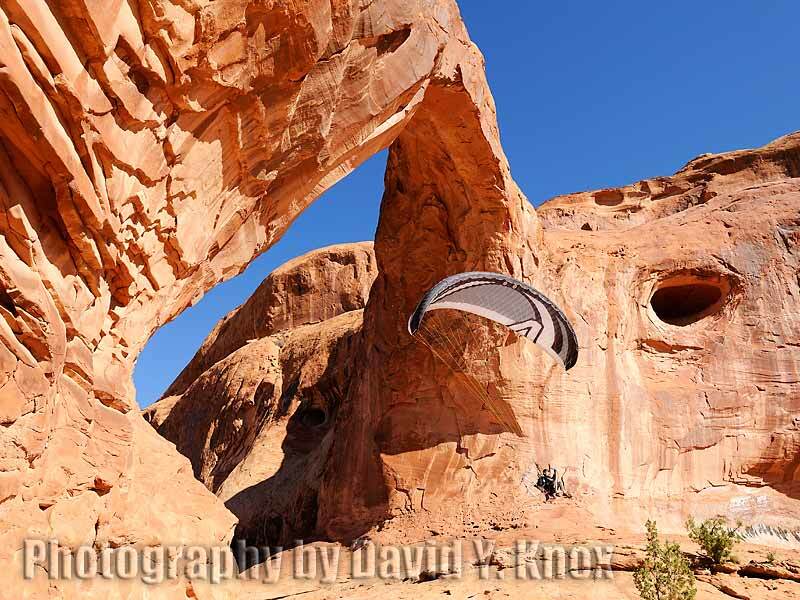 The photographer flying his paramotor through Corona Arch. Moab Area, Utah, USA (in 2009). The photographer flying his paramotor between the giant saguaros near the Apache Trail. Arizona, USA (in 2009). The amazing paramotor: a 4-stroke engine (from BaileyAviation) mounted on a titanium / carbon fiber chassis (from R.ultralight). Truckhaven, California, USA (in 2018). High-Tech Toy; the Inspire 2 drone by DJI that flew away and consequently crashed. Saint-Jean-Cap-Ferrat, French Riviera, France (in 2017). 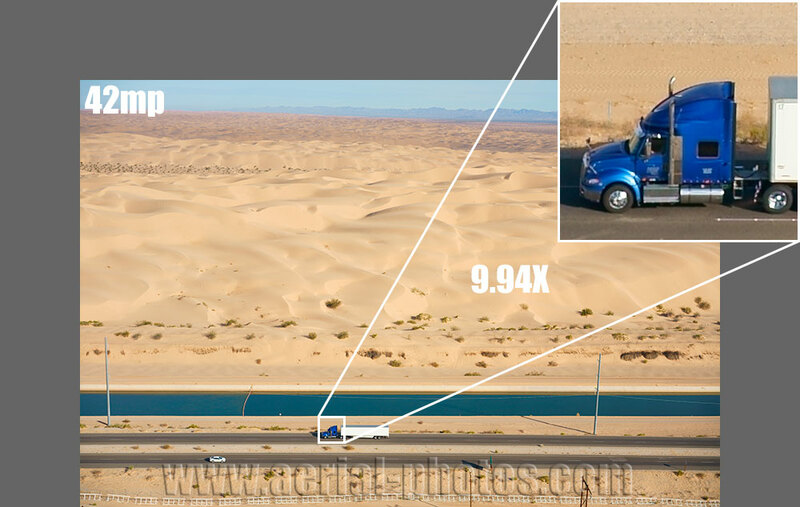 Aerial photography without an aircraft by means of a telescopic mast (from PhotoMast). 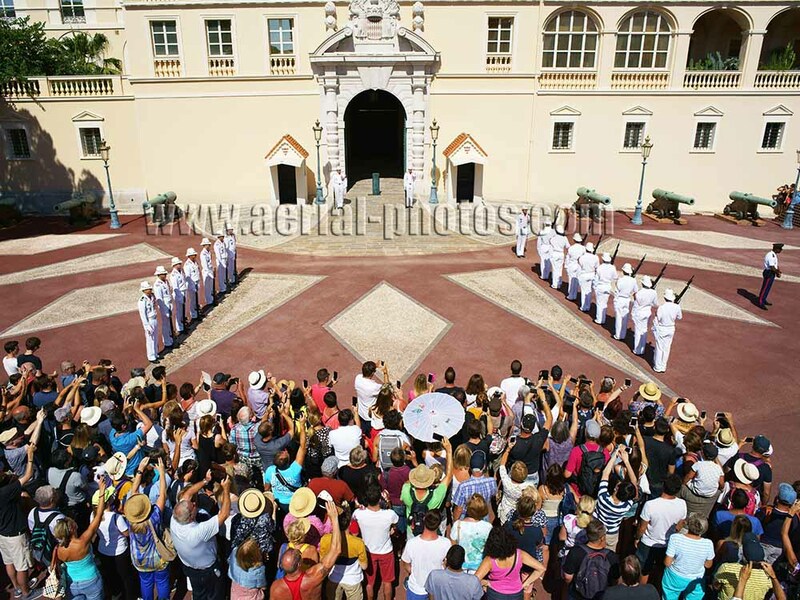 The changing of the guard in front of the Prince's Palace. Principality of Monaco (in 2018). For aerial photography, I have been using a Mamiya 7 (56x70mm film camera), a Sony α7R III (42mp - 7952x5304 pixels) or a Nikon d800 (36mp - 7360x4912 pixels). The Mamiya 7, a 6x7 rangefinder camera offers a ratio of light weight to large print potential like no other camera on the market. The Mamiya lenses produce very sharp prints when used with fine-grained films such as Velvia 50, Velvia 100 F, Provia 100 F, Astia 100 F, Technical Pan 25, Tmax 100 etc... The Sony α7R III or the Nikon d800, both full frame digital cameras work wonder for aerial photography. All the photos on sale through Alamy.com have been made with prime lenses only. As compared to zoom lenses, they are sharper, especially in the corner, consequently, they have a greater print enlargement potential (30x40 inch / 75x100 cm and beyond). Prime lenses are also better to deal with the dim morning or evening light we prefer in aerial photography. The magnificent Mamiya 7 (introduced in 1995). The mini (657gr) but migthy (42mp at 10fps) Sony α7R III (introduced in 2018). 20mp (5272 x 3948 pixels) with the X5S camera from the Inspire 2 DJI drone. Sea Pinnacles. Esterel Massif, French Riviera, France (in 2017). 36mp (7360 x 4912 pixels) with the Nikon D800 camera. 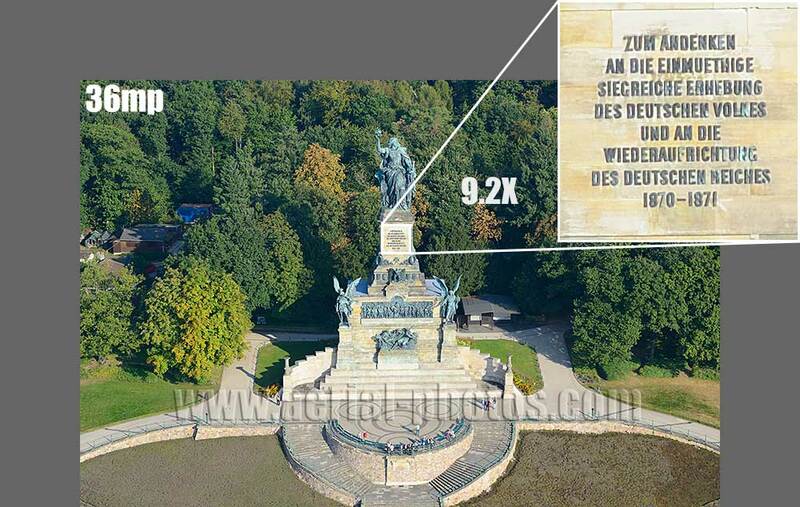 Niederwalddenkmal, Hesse, Germany (in 2016). 42mp (7952 x 5304 pixels) with the Sony α7R III camera. Algodones Dunes, Sonoran Desert, California, United States (in 2018). Ordering of theses high-resolution aerial photos is done through Alamy, a large stock photography agency: click on "Enter a Keyword" or the cash register image to get to my available photos at Alamy. The photos for sale are reasonably priced and are not more expensive than non-aerial photos, although they are more expensive to produce. They are on sale as "Rights Managed" photos only (the price is determined by usage).